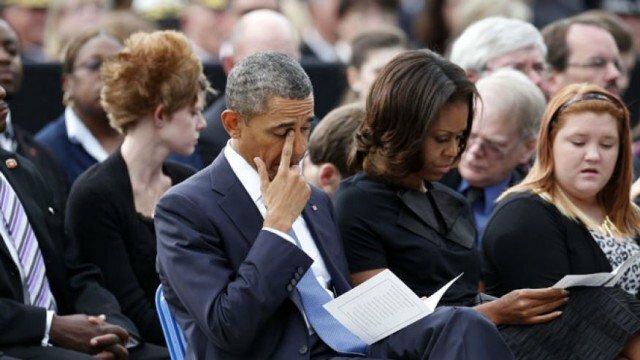 Barack Obama has reiterated calls for changes to US gun laws at a memorial service for the victims of last week’s shooting at the Washington Navy Yard. President Barack Obama said tears were “not enough”. He told mourners Americans must insist that “there is nothing normal about innocent men and women being gunned down where they work”. Twelve people were killed last Monday by contractor Aaron Alexis, who was himself shot dead by police. Aaron Alexis, 34, reportedly had untreated mental health difficulties. Barack Obama called on Americans to abandon their “creeping resignation” to mass shootings. Acknowledging that “the politics are difficult” – a reference to his failure to get measures through Congress earlier this year – the president said change would not come from Washington. “Change will come the only way it ever has come, and that’s from the American people,” Barack Obama told the crowd. President Barack Obama and First Lady Michelle Obama met privately with victims’ relatives ahead of the shooting, the White House said.